but the grass is green, the aspens are leafing out. Springbeauty bloom prolifically under the aspen trees, a sure sign that the snow has only recently melted. An elk herd rumbles through the trees as we approach. A few pause to look back before melting into the aspen. and balsamroot show their colors. 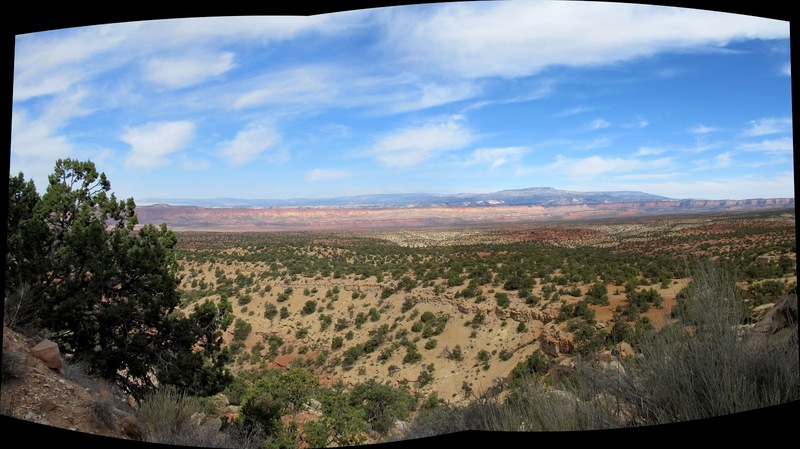 Our last ride in Capitol Reef country was to Stud Horse Peaks, shown above. The highest is 7000 ft in altitude. This area is west of the park boundary, so Daisy was allowed to run with us. She was quite pleased. 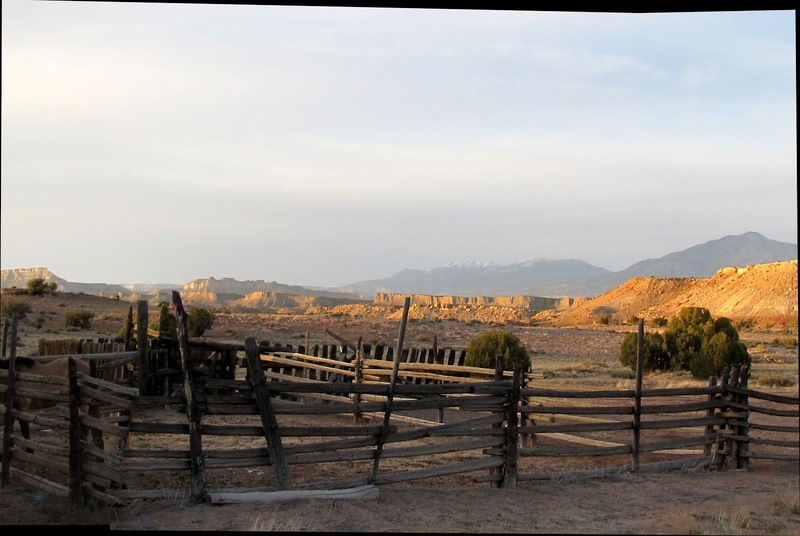 The name of the peaks may have originated because of wild horse herds that once lived in the area. Legend has it that a stallion would stand on the peaks and keep guard over his mares. Frankly, this seems unlikely since the "peaks", which are actually more like mesas, are a couple of hundred feet above the valley floor, a long way for the stallion to travel away from the herd, and a long rumble downhill over rocky terrain if he actually saw danger and needed to race to the rescue. We found this structure not far from our trailhead. If it's for sale or rent, are you interested? A little work might be required before you move in, but it could keep the rain off (if you're lucky). Daisy approves! Need a new truck cab? This one's available. Spare tire included, and zero carbon emissions guaranteed. A running board was lying a hundred yards away. Maybe a little looking would turn up enough to piece this baby together and take her for a spin. Apparently, an "adit" mine (horizontal mine shaft) is up on these mountains somewhere, according to the USGS maps. This explains why someone went to the trouble of carving out a road. The old road is now abandoned and the mountainside is slowly but surely taking it back. The washout depicted here is only the beginning. In places, huge boulders had fallen across the road bed. We rode as high as we could and were rewarded with a fine view of the reddish Circle Cliffs, and past them all the way to Boulder Mountain. Here's a view of Boulder Mountain (11,330 ft) framed by tree branches. It's about 30 miles away. Returning to the trailhead, we realized that we'd had a pretty fine view, even from our parking spot. That's what I love about the western U.S.. The views are good nearly everywhere! 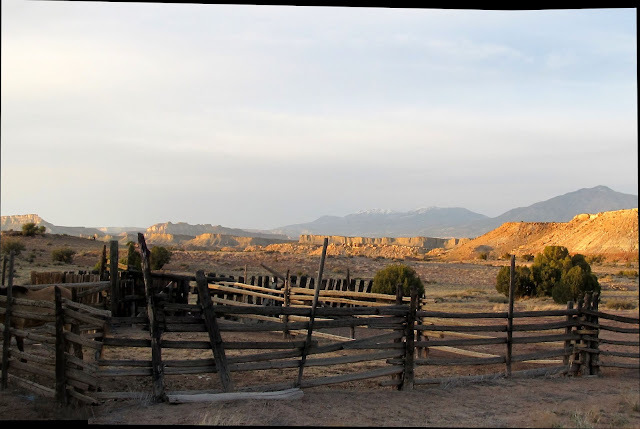 We camped next to an old, ramshackle cowboy corral on BLM land outside Capitol Reef. The corral was good enough to hold our boys, and roomy enough so they could eat, roll, and lie down whenever they wished. The post-sunset colors are always unique. In the light of the full moon, we could easily see what the horses were up to, even in the middle of the night. Apparently, just hanging around scratching various itches was a nice break for them. After a night with the freedom to rock and roll, Boss had a serious bad tail-hair morning.